I use my pressure cooker several times a week. I love how easy it is to make flavorful food. It's especially handy when I go through the entire day thinking that I should decide on something for dinner - and then the day is over, and I haven't decided a thing. With the pressure cooker, I can just pull something out of the freezer and still have dinner on the table at a reasonable time. I've made this particular recipe several times. I just keep forgetting to take any pictures... And the pictures I finally took this week aren't all that great, but I'm still gonna post. Drain pineapple, adding juice to PC and reserving the chunks. Mix brown sugar, salt, pepper, ketchup, vinegar, soy sauce, and water with the pineapple juice. Place chicken breast in PC, close lid and seal. For frozen breasts, set time for 16 minutes. If you're using thawed chicken breasts, 10 minutes should be enough - or 5 minutes if you cut the chicken into chunks first. Allow pressure to release naturally. Remove lid from pressure cooker. Remove chicken; cut into chunks or shred (unless you already cut it up, then just leave it in there). Set PC to saute and add vegetables. Stir in cornstarch mixed with water and continue cooking until vegetables are almost cooked and sauce is thickened and bubbly. Add reserved pineapple chunks and chicken; continue heating for a minute or two. Serve with rice and chow mein noodles. Super simple and tasty! And, of course, feel free to add whatever vegetables you have. I love my pressure cooker. It makes everything so easy! OK, I don't do everything in the pressure cooker; there are still things that just need to be cooked on the stove or in the oven, but I certainly do use it a lot. This is one of our favorite recipes. The flavors are so good! Season beef with salt and pepper. Mix brown sugar, ginger, garlic, soy sauce, and water. in PC. Add beef; marinate for 30 minutes or longer. When ready to cook, place insert in PC and cook for 13 minutes. Allow pressure to release naturally. Once pressure has released, remove lid and set PC to Sear. Add vegetables and cook for 2 to 3 minutes. Mix water and cornstarch and add to PC; cook until thickened and bubbly. Turn PC off and stir in green onions. Serve with rice. Optional: add a pinch of red pepper flakes. You can also add some sliced onions if you're like me and can't cook without onions. I really think some snow peas would be good in this, though I haven't tried it that way yet. Tonight was the first time I used the red pepper, and it was really good - so I'm officially adding that to the recipe. Of course, if you don't have a red pepper, feel free to leave it out. Add a bit more broccoli; add an extra carrot. I think it can be pretty flexible. Also, I never actually pay attention to how much steak I have, or even what kind it is. I just grab whatever I have in the freezer. The PC makes it all good and flavorful and tender. And, since there are just the two of us, we have enough leftovers to have this again in a few days. I warm the leftovers up in the pressure cooker, too, and they taste just as good as the first time. Or maybe better. *there are different ways of cutting carrots into matchsticks, but I use the method described on this page. I guess I didn't come up with that all on my own... It's really quite easy, and they just seem like the right carrots for this recipe. Break lasagna noodles into pieces, cook according to package directions, and drain. Brown hamburger, onion and garlic; drain excess fat. Put hamburger, noodles, and remaining ingredients into crockpot and mix well. Cover and cook on low for 8-10 hours. I thought I had copied this recipe from the old blog I set up way back when we first got Earthlink, but realized tonight - when I went looking for it - that I never had. I haven't made it in ages, so no pictures, but basically, it just looks like messy lasagna. It definitely tastes just like lasagna - without nearly as much work. Can't complain about that! It seems I've completely neglected this blog! Has it really been since January? And here we're already in December. We have been eating, really we have. I just haven't been keeping track of any of it. I've actually been doing a lot of cooking in my pressure cooker. Yes, I kept hearing about how handy these appliances can be, and I decided to buy one. I got the Farberware one from Walmart. From what I can tell, they're all pretty much the same whether you buy the Instant Pot that everyone is talking about, this one from Walmart, or another brand. I really didn't use my pressure cooker much at first because I really didn't know where to start. 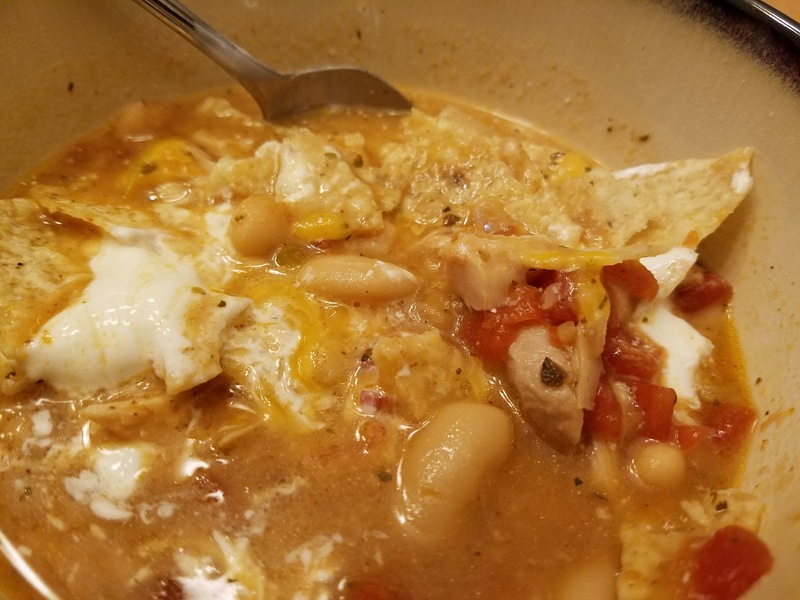 Thankfully, I stumbled across the Farberware 7-in-1 Pressure Cooker Facebook group (although other brands are more than welcome), and that has made all the difference. Questions answered, recipes shared, and plenty of support. Now, I use my PC all the time. It really is as handy as everyone said. We had this turkey tetrazzini for dinner tonight. 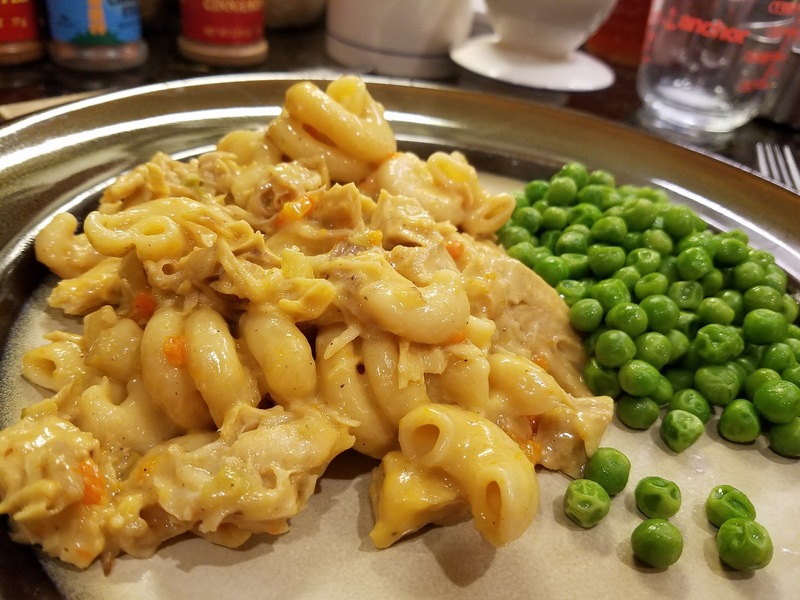 I've made it before on the stove, but it turns out so well, and it's so easy in the pressure cooker, I see no reason to do it any differently from now on. Heat PC on brown/sear setting; melt butter. Add onion, celery, carrot, and green pepper; saute until cooked and starting to brown. Add flour, salt, and pepper; cook for a few minutes. Stir in broth, milk, pasta, and turkey. Depending on your time schedule, you can either release the pressure when the time is up or do a Natural Pressure Release (NPR). Once the pressure has been released, remove the lid and stir in the cheese. Serve immediately or replace the lid and leave on the Keep Warm setting until ready to eat. I really love that I can brown or saute things right in the pot before adding other ingredients and setting it for pressure cooking (or even slow cooking). 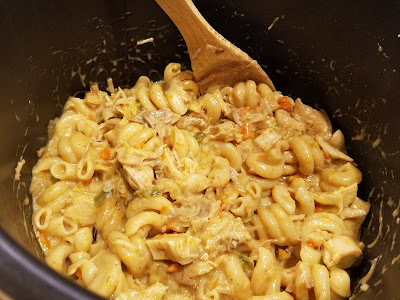 The pressure cooker will also keep the food warm until we're ready to eat, so it's great for throwing everything in whenever I have time and then expecting a great meal ready at dinner time. It's definitely my kind of kitchen appliance. It's time for another edition of Fantastical Food Fight, where every month a theme or ingredient is chosen, and we all choose a recipe - from a cookbook, blog, or our imaginations - and then share on the same day. This month's theme is Slow Cooker Soup, and what could be better during the cold month of January? 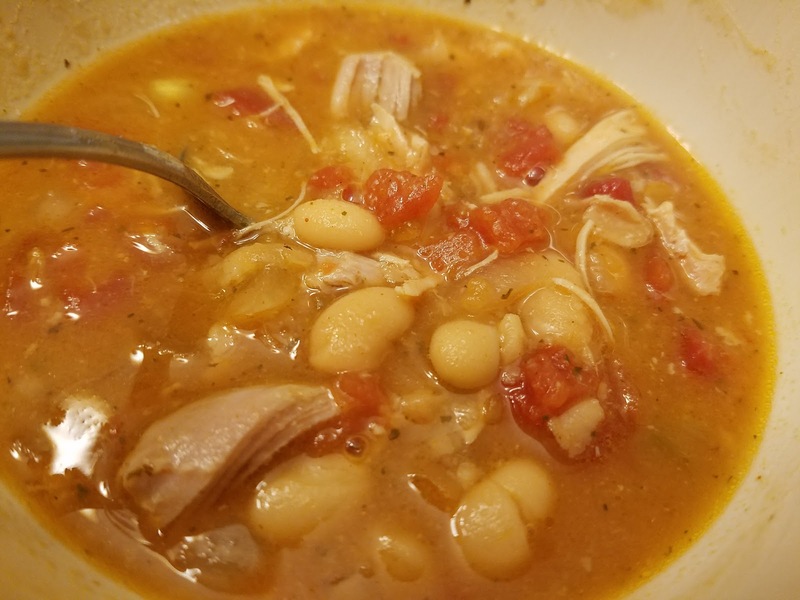 I love being able to throw some ingredients into the slow cooker first thing in the morning and have a yummy soup by dinner time. Talk about easy! I could probably eat nothing but soup all winter. I've made this particular soup twice so far, and we really enjoy it. It's very simple and the flavors are fantastic. Place one can of the Great Northern beans into the slow cooker and smash with a potato masher or back of a fork. Add the second can of beans and all other ingredients to the slow cooker, stirring to combine. Cook on low for 8 hours, or high for 4 hours. Remove chicken from slow cooker, shred, then return to the slow cooker and stir until combined. Serve topped with sour cream, grated cheese, and tortilla chips if desired. The first time I made this soup, I used a can of Great Northern beans and a can of Cannellini beans because that's what I had. I also used a can of diced chipotle tomatoes, which gave the soup a really nice flavor. The second time I used home cooked Great Northern beans - 1-1/2 cups of beans and 3/4 cup liquid = 1 can of beans. And I used the tomatoes with green chilies. Both soups were yummy, and of course that's the beauty of soup - ingredients can be adjusted according to your tastes and/or what you have on hand. Also, though the theme of this Fantastical Food Fight is Slow Cooker Soups, this soup is just as good when made on the stove; it just needs more attention than when throwing everything into the slow cooker. (and sometimes I just don't get everything together early enough in the day to use the slow cooker) For a little extra flavor when cooking on the stove, cook the onions in a bit of olive oil until translucent then add the spices and cook until fragrant. Add the rest of the ingredients, bring to a boil and then reduce heat and simmer for 45 minutes or so, until chicken is cooked.